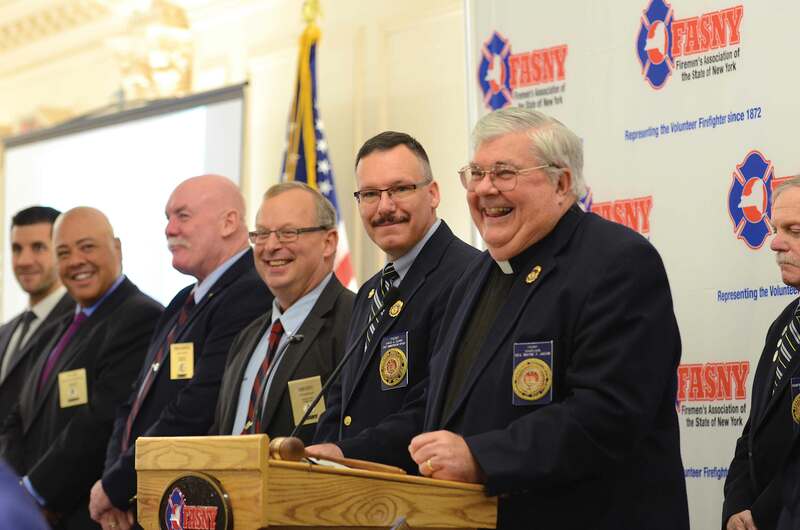 Democracy is defined as “the free and equal right of every person to participate in a system of government.” On November 7, a democratic spirit filled the Desmond Hotel and Conference Center in Albany as the 2015 FASNY Legislative Conference kicked off. The first order of business was for the FASNY Legislative Committee to meet with the sectional and county legislative chairs. The remainder of the day was left open for the regional legislative caucuses to get together. Sunday morning’s agenda started off bright and early with welcoming remarks from President Robert N. McConville and a blessing from Chaplain Wayne F. Jagow. 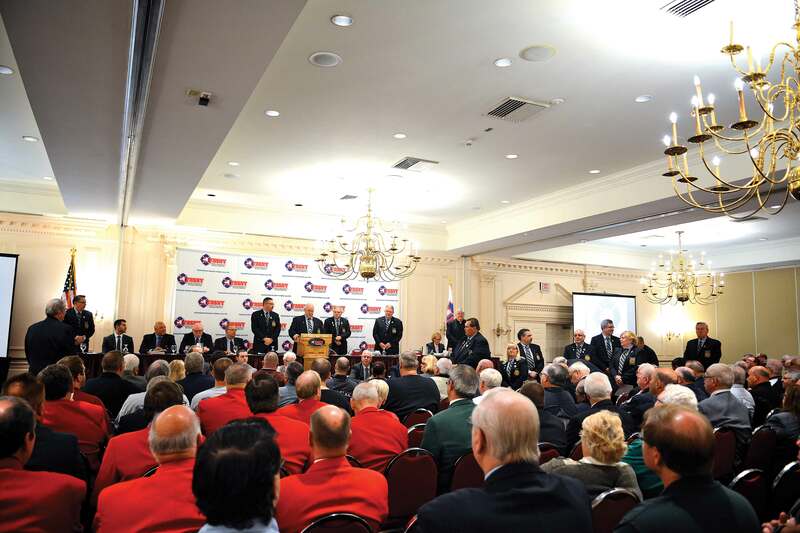 After the dignitaries in attendance were introduced by First Vice President Kenneth Pienkowski, it was time to announce the winner of the prestigious Golden Trumpet Award. 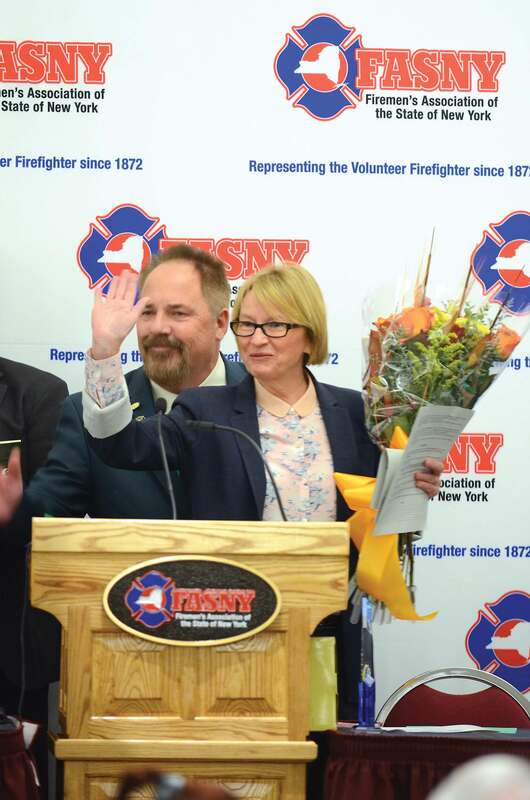 This award is given to an individual who makes a substantial contribution to the volunteer fire service in New York. 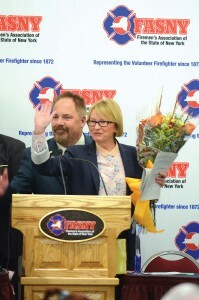 The 2015 choice was clear: Assemblywoman Aileen Gunther for her continued legislative support and advocacy on issues of importance to volunteer firefighters. 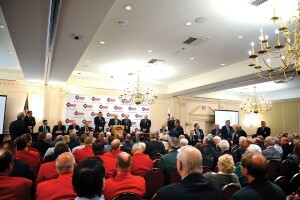 In addition to adopting the Association’s legislative agenda, the conference is also a good opportunity to get important information out to the membership. Attendees at this year’s conference heard from attorney Anita Pelletier on the Not-for-Profit Revitalization Act and how it impacts fire companies. 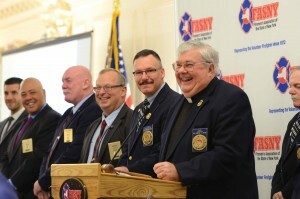 They also heard from Jerry DeLuca, executive director of the New York State Association of Fire Chiefs, who spoke about the fire service’s initiative regarding sprinklers in residential structures. Before attention was focused on the legislative agenda, one more “thank you” had to be given out. Earlier in November, his lifetime of work on building code issues by the International Codes Council (ICC) at its meeting in California. As a tribute to his years of service to FASNY and his fellow volunteer firefighters, the ICC award was represented before his peers at the legislative conference. The agenda also includes study bills that would examine the development of a propane safety and education program, analyze an increase in VFBL/VAWBL disability benefits, and evaluate current school fire and life safety standards. FASNY’s Legislative Committee would like to thank all those who participated in the development of the 2015-16 legislative agenda and encourages any interested FASNY member to get involved next year.